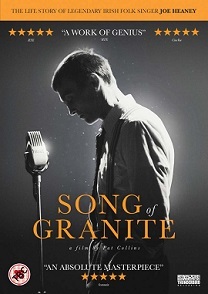 Song Of Granite is out on DVD 2nd April, 2018. And to celebrate we have a great competition for you and 3 copies on DVD to give away. The latest from director Pat Collins (Silence), SONG OF GRANITE is a critically acclaimed, lyrical and unconventional profile of the life of the complex and enigmatic Joe Heaney - one of the greats of traditional Irish singing (sean nós), and the country that made him. Shaped by the myths, fables and songs of his upbringing in the west of Ireland in the early 1900s, the film charts Heaney’s emergence as a gifted artist and how his career success came at a personal cost as he journeyed from rural Connemara through Glasgow and eventually to New York City. Ireland’s submission for the Best Foreign Language Film Oscar 2018 and featuring performances from Colm Seoighe, Macdara Ó Fátharta, Jaren Cerf, Lisa O’Neill, Damien Dempsey, and singers Micheal Ó Confhaola and Pól Ó Ceannabháin, SONG OF GRANITE is a distinct portrait of Heaney’s life and a universal exploration of the power of the human voice. Who Directs Song Of Granite?